Just 26 miles from the front doors of the Moscow Food Co-op, down a beautiful, tree-lined dirt road, sits Brush Creek Farms, the umbrella business which houses Brush Creek Creamery. It is on this rural piece of land in Deary, ID that the Salmeri and French families live. But they do not inhabit this land alone. Five Jersey heifers- Butterscotch, Carroty, Brie, Bluebell and Edna, roam on 100 acres of pasture and provide the dairy with enough raw milk to make cheese for our community’s Co-op, restaurants and farmers markets. The average gallon of milk travels 320 miles from cow to cart, so this minimal distance is a welcome alternative. We know that most people can’t name the cows that provide the milk for their cheese, but Brush Creek Creamery does things differently. They fall into the Small-herd Exemption, overseen by the Idaho State Department of Agriculture, which means three currently-lactating cows are all they’re allowed to milk. This keeps things simpler. Their cows are milked twice daily by Benny French, age 20, and cheese is produced from raw milk in a 50 gallon vat several times per week. 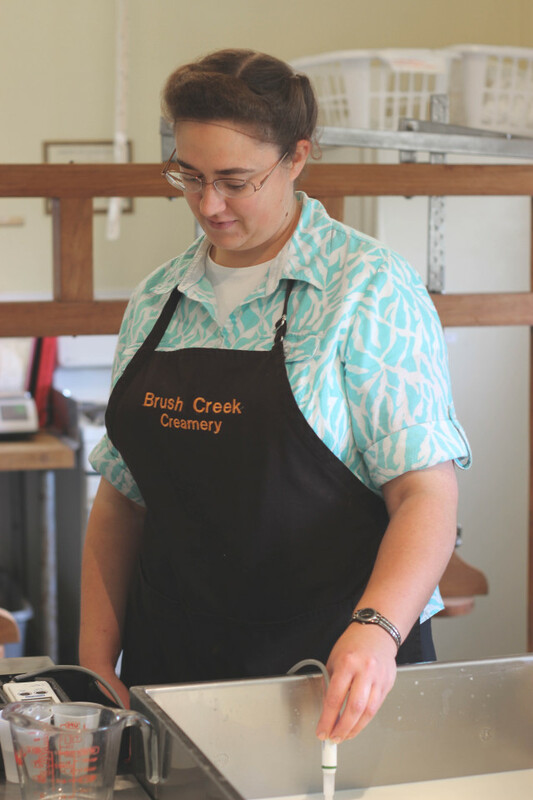 During our visit we met with Rebeccah Salmeri, the woman at the forefront of Brush Creek’s cheese making and sales. She and Hannah, one of the creamery’s employees, are making a batch of CamemBear, their take on camembert, a brie-style cheese made without the addition of cream. This cheese, along with their cheddar, has won several awards from the American Cheese Society, including one that recognized their cheese as the best in North America in 2011. When asked about their way of making cheese, Rebeccah’s passion becomes clear. She describes the benefits of using raw, unpasteurized milk, including how the beneficial bacteria is left intact, unlike commercially produced cheese. Their size ensures Brush Creek is able to maintain a cleaner facility than one with hundreds or even thousands of cows, but she still dreams of a day when they can increase production. “Becoming a graded dairy means that we can keep more cows, but it’s expensive and there is no one in the area to grant those licenses,” she explains. So for now, they’ll stick to milking three cows at a time and carefully making the products our community craves. The Moscow Food Co-op was the first retailer to carry their products since their move to Idaho in 2010. And for that, they’re grateful. But the Co-op is grateful as well. Our Head Cheese Monger, Dalynne Veeder says, “Selling cheese from Brush Creek Creamery allows us to fulfill our mission of supporting local-food producers. And being able to see their operation firsthand is something I can’t do with larger cheese makers.” Along with the Co-op, you can find Brush Creek at the Moscow Farmers Market selling cheese, milk, eggs, pasta and more, and their cheese can also be found at Mystic Café and Blue Lantern in Lewiston and Pilgrim’s Market in Couer d’Alene.